In November 1681 fire swept through Goldsmiths’ Hall in London destroying much which would have been of great interest and importance to historians and collectors alike. One of our greatest losses from the point of view of those interested in identifying the makers of silver plate of this period is the loss of the records of makers' marks. Although a new mark plate was raised in 1682 (according to Chaffers the 1675 plate survived) (note 1) and the makers struck their marks on this, the mark book in which their names would have been recorded has not survived. The marks struck on this new plate are in nine vertical columns and about one third of the way down the second column is a mark which has been attributed to Pierre Harache I whose Britannia standard mark, registered in 1697 and positively identified by his name, has certain motifs incorporated in it which are similar to those appearing in the 1682 mark which has the letters P H to identify its maker. These motifs are not peculiar to the Harache family, although they were also used in the mark registered in 1698 by Pierre Harache II, but can be seen in an, as yet, unidentified mark which displays the letters L B to identify its maker. (New Jackson p146). However I believe, as others before me have believed, that there can be no doubt that the P H mark on the 1682 plate is that of an Harache but which one? The only Pierre Harache known to have gained his freedom of the Goldsmiths’ Company at this early date, which he did on 21st July 1682, and therefore eligible to register his mark on the 1682 mark plate was the man, born in Rouen in 1639, who has been identified as Pierre Harache I and reason would seem to dictate therefore that the mark in question was his. However new evidence has now come to light that must cast some doubt on this. 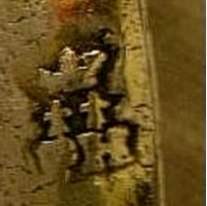 An unregistered sterling maker’s mark has been discovered on items of small work of the early 18th century (note 2) which so closely resembles one of the four Britannia marks of Pierre Harache II, born in Rouen in 1653 but only distantly related to his namesake above, that there can be no doubt that it was his Fig I. Similarly an unregistered sterling maker’s mark has been discovered on an item of small work of the same approximate date (note 3) which resembles the Britannia mark of Pierre Harache I much more closely than does the mark appearing on the 1682 plate and it is difficult to see how it can be other than his Fig II. In fact the mark on the 1682 plate is very like another of the four marks registered by Pierre Harache II but its position on the plate suggests that it was struck either when the plate was raised or soon after and cannot therefore be that of Pierre Harache II who didn’t arrive in England until 1686. A possible explanation is that there was a third Pierre Harache and that this mysterious mark was his. Both Heal (note 4) and Grimwade (note 5) hinted at the possibility that there was a third Pierre Harache but neither could identify him. Recent research has however brought to light enough evidence to show that there must have been a third Harache bearing the name Pierre although he still remains a shadowy figure. This research has exposed the fact that the Haraches worked as a Company under the title "Pet: harache &c goldsmiths" and a bill made out to St. George Esq. of Dublin in 1703 clearly shows, from the handwriting, that the writer of this bill was neither Pierre Harache I nor Pierre Harache II. Further it was not made out by Stephen Hobbema, Pierre Harache I’s son in law, who kept the Company accounts and receipted it. Christopher Hartop, In writing the introduction to "Beyond the Border" has made clear that in most workshops more than one maker would have been employed in the production of an item of large work and that the marks appearing on such pieces need not necessarily therefore relate that piece to any one of these makers (note 6). The marks must, in fact, be looked on as ‘workshop marks’. The marks on small work on the other hand almost certainly relate the piece to the maker as only one man would have been involved in its production. This being the case the two small workers’ marks mentioned above must be accepted as those of Pierre Harache II and Pierre Harache I respectively whereas the three large workers’ marks under review here may not relate to either specifically. 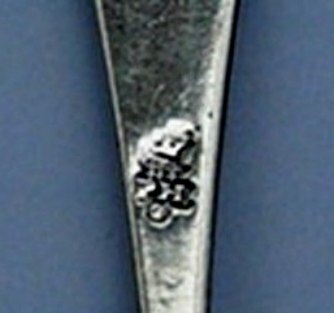 If the sterling maker’s mark struck on the 1682 mark plate was a workshop mark and was related to a third Pierre Harache rather than to either of his namesakes why do some of the registered marks of Pierre Harache II resemble it so closely? 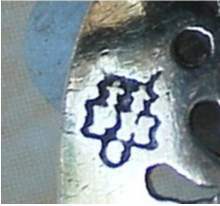 A possible explanation is that Pierre Harache III had retired from actively practicing his craft by 1698 when Pierre Harache II registered his marks ( he is known to have been dealing with Hoares’ Bank in second hand silver after 1697) and Pierre Harache II, who had not until then had a mark of his own, adopted the main motifs of the workshop mark as his, Pierre Harache I having already registered his own mark the year before. Peter Harache III was probably the first of the three to arrive in this country and is likely to have been responsible for setting up the workshop in which all three worked under the title ‘Pet: harache &c goldsmiths’ (note 7). This explains a mystery which, until now, has attached to Peter Harache I. He arrived in this country in October 1681 with very little with which to earn his living (a letter from the Treasury to Customs Officials dated 20th October 1681 exempting him from Customs Duty mentions nothing but 238 ounces of mixed old and new plate) (note 8). He was not endenizened until June 1682 and not made free of the Goldsmiths’ Company until 21st July of that year, the date on which the new letter of the year came into use (note 9), yet the earliest example of the mark attributed to him is on candlesticks struck with that letter! A pen and ink drawing at Goldsmiths’ Hall of a 17th century silversmith’s workshop shows five men all engaged in different tasks and an early print of such a workshop shows no fewer than fourteen men and a boy variously engaged at furnaces, a lathe, a wire stretcher, a snarling iron and several other benches. This Harache certainly did not have the wherewithal to set up his own workshop of this sort in the time available to him by 1682 and must therefore have made use of one already established so who was responsible for this workshop? The first member of the Harache family to come to England was Peter Harache I’s brother Nicolas who was here in 1668 (note 10) and he could have set up a workshop although there is no evidence that he was a goldsmith. The evidence is, however, that Nicolas died circa 1677 and whatever trade he plied it was not carried on by his widow since she returned to France in that year. It would seem therefore that no workshop could have survived from that time. The next family member to flee France and settle in London was Peter Harache I’s sister Madeleinne whose husband Edouard Hobbema presented his témoignage (note 11) on 18th July 1675 (note 12). Edward was a master goldsmith who had been working in Paris before migrating to England, probably in the workshop which Pierre Harache I had used when in Paris in 1668 (note 13). It seems that this is the most likely date for the setting up of any workshop in which a family member could have worked on arrival in this country. No indication has been found that Pierre Harache III came to this country from Rouen and the most likely scenario is that he arrived with the Hobbema family from Paris. If he was responsible for setting up the Harache workshop and for registering the mark on the 1682 mark plate which relates to it then the features of the above hypothesis, which explains the form taken by Peter Harache II’s mark, falls into place. However this leaves open a mystery; according to the records available from the period the evidence is that the Goldsmiths’ Company would not have accepted the registration of a mark by a non freeman and, as stated above, apparently the first Peter Harache to gain the freedom of the Goldsmiths’ Company of London was Peter Harache I! (note 14) If this sterling maker’s mark, which is struck on the 1682 mark plate, is that of Peter Harache I, as has been assumed until now, then whose workshop was he working in when he entered it and what form did that workshop’s mark take? When he entered his Britannia standard mark in 1697 he gave his address as Suffolk Street and the belief has been held that this was the site of the workshop. However there is no reference to a Peter Harache in the rate books for Great Suffolk Street until 1686 so if this was the site of the workshop it must have been in the occupancy of someone else when Peter Harache I became free of the Goldsmiths’ Company in 1682. 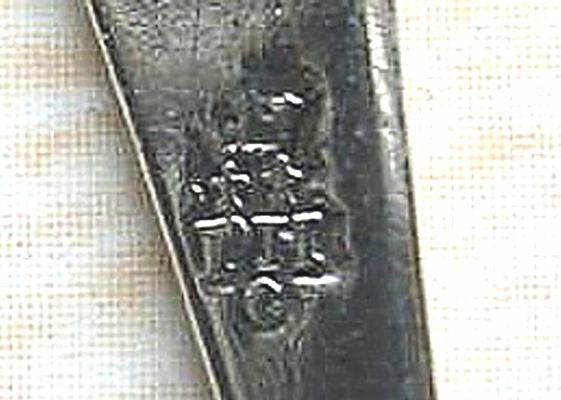 The denouement is that there must now be some doubt about the attribution of the sterling maker’s mark, struck on the 1682 mark plate, to Peter Harache I. Further it must now be accepted that more than one workman would have been involved in the production of large plate coming out of the Harache workshop and that therefore none can be attributed to any particular Harache. A registered mark appearing on an item of plate must indicate that the man who registered that mark was primarily responsible for that plate but that to all intents and purposes the mark is a workshop mark. NB: It is now known that Peter Harache I died in 1712 and that Peter Harache II returned to France where he died in 1718. The death of a Pierre Harache in 1700, as recorded by Heal, was probably that of Peter Harache II’s son who was born in 1696 and about whom nothing more is recorded. 2 A mote spoon and three snuff spoons circa 1700-1710. 8 Op Cit T 11/8 p11. 9 It is a misconception that the new letter of the year always started on 29th May at this time. It did not become regularised in this way until it became a date letter by law in 1697. 11 Témoignage: A document carried by a person who had professed Catholicism in order to leave France stating the he or she was a Protestant. 13 Archives Nationales Z1B 517. 14 It is possible that any Harache working in this country before the arrival of Pierre Harache I was free of some other Guild Company.